Believe in love at first sight? Or that the universe conspires to bring people together for a reason? These are universal questions that everyone considers, no matter their experience or their preference. Critically acclaimed bestselling authors, Becky Albertalli and Adam Silvera combine their talents in Simon & Schuster’s latest YA release, What If It’s Us – a smart, funny, heartfelt story about two very different boys who can’t decide if the universe is pushing them together or pulling them apart. Every love story has its rollercoaster of emotions and this one is no different. We’ve all had one of those moments – that unexpected, random encounter with the cutest person we’ve ever seen, a moment when time seems to stand still and you lose the power of speech, or worse, the words tumble out in a nonsensical way you have literally no control over. It could happen anywhere, anytime, but when it happens, you’re left convinced that there’s a little bit of the universe and serendipity at play. 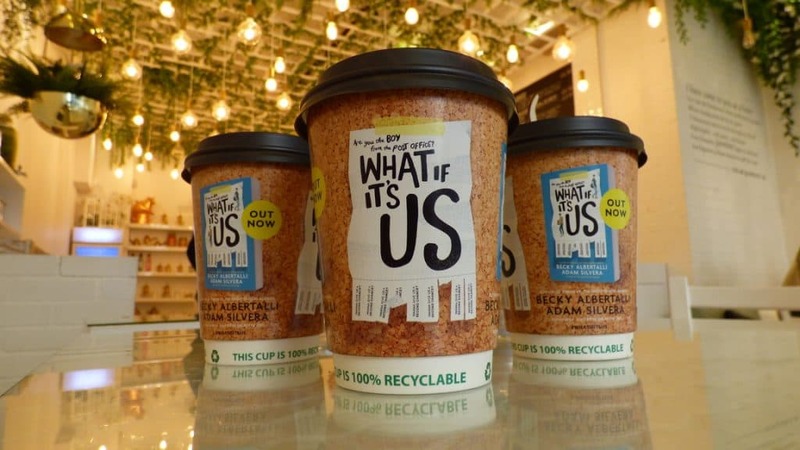 To promote What If It’s Us, a Young Adult title aimed at LGBTQ teens, Simon & Schuster is advertising on branded coffee cups in Tabletalk’s network of independent artisan Coffee Shops and Cafes across London. Just the kind of environment one of those random encounters might knock you off your feet. Whether it’s meeting friends, finding a comfortable place to study away from home, or simply looking for time out to indulge in a bit of me time to read a book, Coffee Shops are a prime hangout spot for teens and the perfect place for publishers to reach young adults.